Quinoa, the curly grain, chock full of protein….it has become my new favorite thing to cook with in the last 6 months! I had no idea what quinoa was a few years ago. It has so many health benefits and the versatility is endlesss! You can bake with this grain, cook with it, add it to cereals, soups, casseroles, top salads with it…so many ways to use it! I first found it in the bulk section of my grocery store, much cheaper than buying it prepackaged. You cook it just like rice, 1 part quinoa to 2 parts liquid. I use chicken broth for my liquid, it adds more flavor than plain old water. This little magical grain looks like tiny round seeds, but when cooked up, they turn into a fluffy ball with a white spiral tail! Now that’s a cool transformation for food! I thought of this recipe from my childhood…only mom use to use ground beef for the filling. I thought, hey- why not leave out the ground beef and sub in cooked quinoa?! Oh yeah, add a few spices like paprika and cumin, some black beans and salsa, top with cheese at the end, and yummmm, now that’s a stuffed bell pepper! 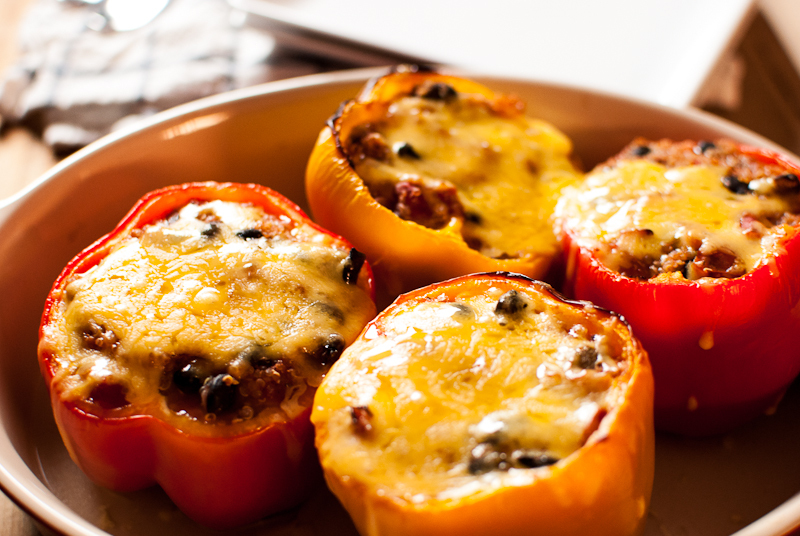 A healthier, newer, version of the old stuffed bell pepper many of us grew up with. 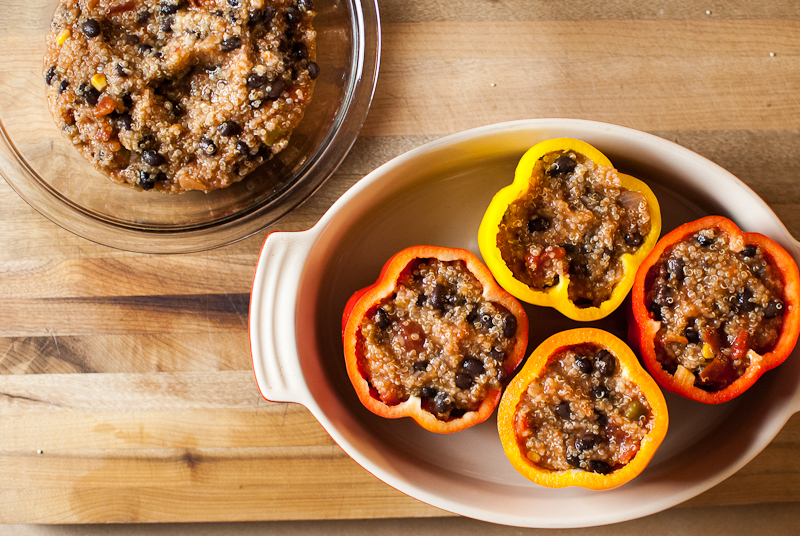 Stuffed and ready for the oven…curly fluffly quinoa with spices, black beans, and salsa! 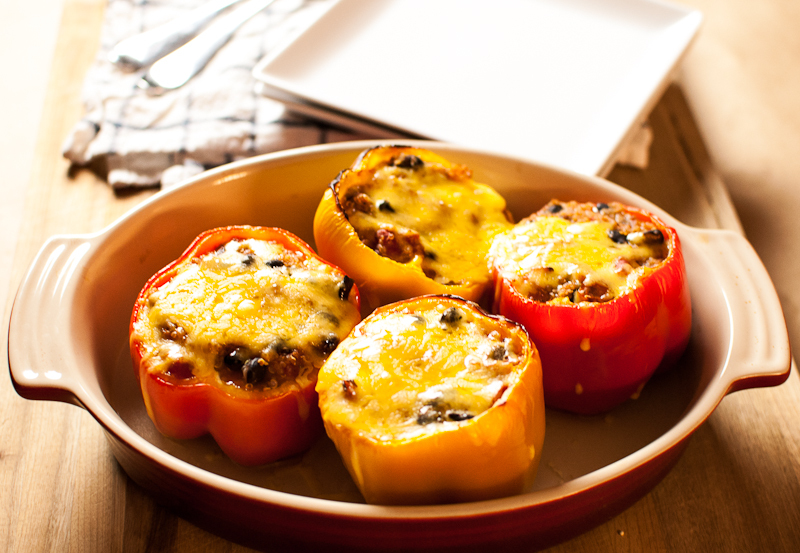 30 minutes later, we have a yummy stuffed pepper topped with melted cheddar cheese, and full of fiber and protein! 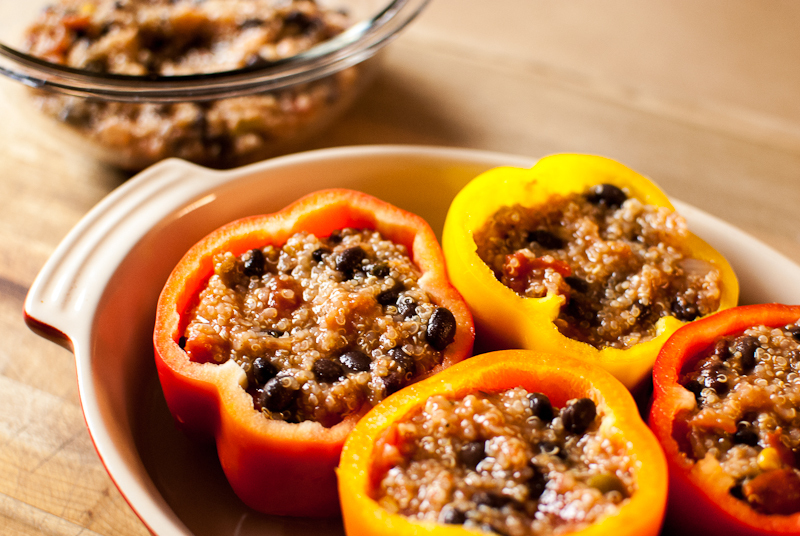 Not your “mother’s” stuffed bell pepper from the 70’s….a much healthier version without the meat. Cook quinoa for 20 mins in a medium pot over low according to package directions. Cut tops of bell peppers off, and pull out seeds. 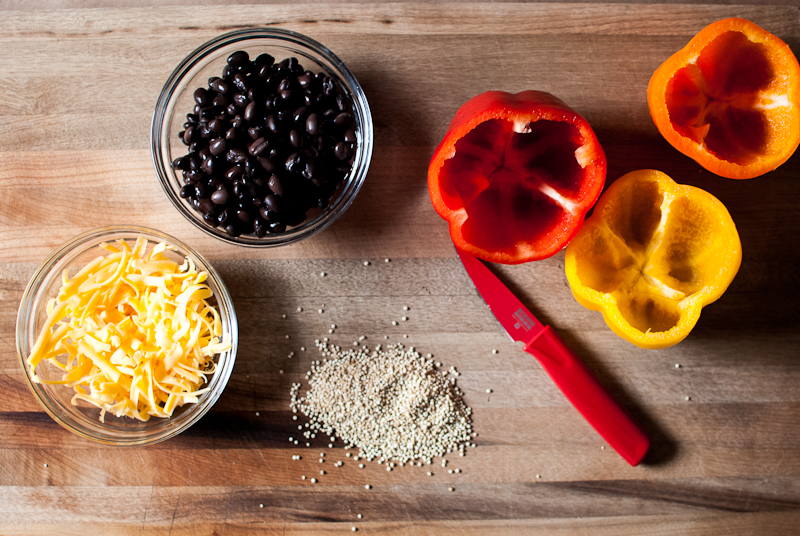 Mix cooked quinoa with spices, salsa, and beans. Cook for 30 mins at 425, add cheese to the top on the last 10 mins. Oh my gosh, I want to eat every last bite! These look delicious, and I love the short ingredient list! I WILL try this one. It looks wonderfully worth eating and nutritional. HOw big of a can of salsa? I used about 12 oz. Depends on how moist you want your filling.